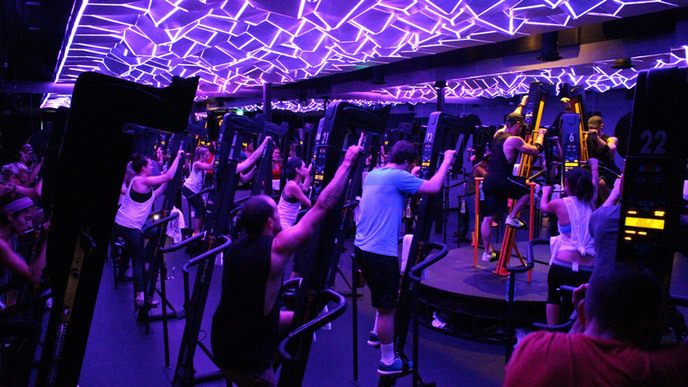 It’s 6:30 p.m. on Monday and celebrity trainer Jason Walsh transforms a bright, sunny room into a dark nightclub—if nightclubs were full of exercise equipment. “Here we go,” he says calmly, marking the start of a grinding 30-minute, full-body workout. A full spectrum of neon lights shines from the ceiling, illuminating the large, darkened room while heart-pounding dance music reverberates all around. We stand roughly a foot above the ground on VersaClimbers: towering exercise machines that simulate climbing. VersaClimbers were trendy in the early 1980s—most notably the workout machine of choice for Paul Newman's infamous bod—but soon became an afterthought. Walsh, who trained Matt Damon for soon-to-be-released "The Martian" and now "Bourne 5", along with Bradley Cooper, Jessica Biel and Justin Timberlake, might have finally made them cool. Using the VersaClimber requires a vertical, cross-crawling movement, which gives you a full-body workout. Throughout the exercise, you’re simultaneously utilizing your arms, back, legs and core muscles. One arm pushes up a handle as the other arm pulls another handle down; your feet alternate pushing down on pedals (similar to a StairMaster). The Rise Nation class has participants engaging in this constant climbing motion with spurts of quick, high-intensity, shorter-stride intervals throughout. Rise Nation students ascend anywhere from 2,000 to 5,000 feet during the 30-minute time frame. To put this in perspective, climbing 2,000 feet is the equivalent of scaling the Eiffel Tower twice; 5,000 feet is like going up to the very tip of the Empire State Building four times. According to a recent article in Men’s Health, Walsh’s 30-minute Rise Nation course has participants burning more calories at a significantly higher rate than other well-known fitness classes. 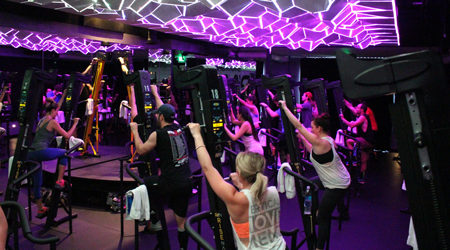 The magazine conducted a blind study comparing Rise Nation with other fitness studios including SoulCycle, Mile High Run Club and RowZone. The results of the study showed that a workout performed by a 6-foot-2-inch, 185-pound male burned 22.3 calories per minute using the VersaClimber compared to 13.3, 13.3 and 13.8 calories per minute, respectively, for the other three classes. Rise Nation also showed the second highest amount of calories burned post-workout (80), just trailing a 60-minute Mile High Run Club class. It’s 6:59 p.m. on that same Monday. As the final song hits its last crescendo, 30 climbers attempt to go all-out for the remaining seconds. When the song ends at 7:00 p.m., Walsh turns the night back into day.